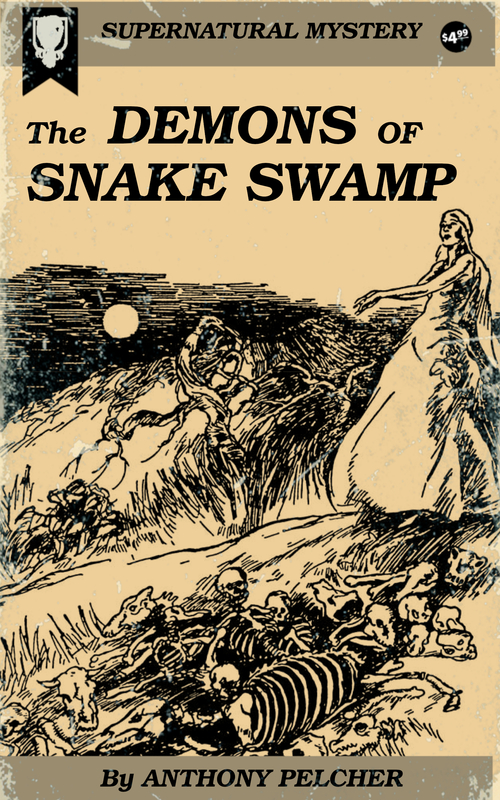 What evil power ruled over the dank depths of Snake Swamp, striking death to bird, beast and man? Whence came the beautiful spectral maiden who roamed its paths by night? “I’ve been pretty much all over the world. For the last twelve years I’ve traveled about the United States and I’ve learned a few things,” remarked Jim Chamberlin, structural engineer and my closest friend and co-worker. “They can claim most anything. There is no reason to believe that gunmen don’t have spooks, the same as medieval maiden ladies, is there?” he replied jocularly. “The place must be crowded with spooks,” ventured Jim. “It’s crowded with snakes, but all I’ve seen so far are harmless and they surely don’t account for the fatalities. There is something mighty uncanny about that swamp. Anyway you look at it,” I gazed off into the murky depths of the forbidding morass as Jim emptied his pipe by knocking it against the log on which we were sitting. He put the pipe in its case with a snap, and arose to his full six feet. “Well then, what do you say?” queried my pal Jim. Had I known the fate that awaited me in the dank depths of that murky hole of Hell, there is little doubt that I would have taken the first train back to New York, instead of walking to our backwoods lodgings and preparing to stalk phantoms in an almost impassable bog.